When I build a system, either for myself or someone else, I often end up with a lower priced, and lower featured motherboard. Unfortunately, it’s often difficult to find reviews for these boards, so it was nice to see this mid-range MSI B360 review popup this morning. Today we have our first B360 chipset motherboard review for you. 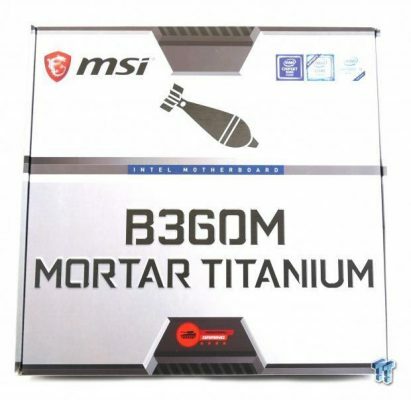 MSI’s B360M Mortar is designed for those who don’t need the fancy features of the H370 or even Z370 chipsets, and would rather save some money. Looks like a full sized ITX board? Cases I own are all mini-ITX. Intel boards that support the latest CPUs in this format seem to be coming down in price (at least on Newegg). Forget about memory – ugh. LOL – DDR4 is stupid expensive right now. Have you seen any non-Z370 ITX boards? I’ve been keeping an ey out for a thin ITX, haven’t seen one yet. Not really that I am aware of. Thin ITX for the wall mounted server cabinet?